Peter Martin: The carbon tax, the mining tax, they'll kill mining right? The carbon tax, the mining tax, they'll kill mining right? 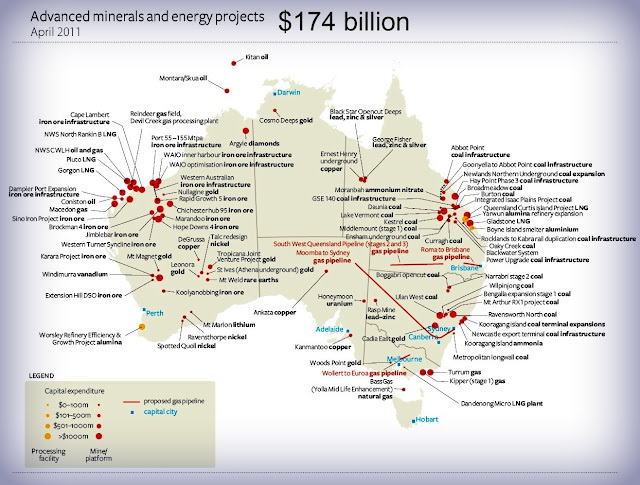 Abbott said the carbon tax would close 16 mines. Neither the mining tax nor the prospect of a carbon tax has made a dent in mining expansion plans with the industry reporting plans that would double spending in the year ahead. Capital expenditure plans collated by the Bureau of Statistics show mining companies intend to lift spending from $35 billion in 2009-10 to $51 billion in 2010-11, an increase of 45 per cent. Plans for 2011-12 suggest a further boost of 63 per cent to a record $83 billion, a figure economists say is almost certainly an underestimate. Whether $83 billion or $100 billion, the planned investment in 2011-12 is well in excess of the $76 billion predicted in this month’s budget. Leading the pack is the giant Gorgon liquefied natural gas project off North West Australia costing a $43 billion. The Gladstone LNG project in Queensland approved earlier this year will cost $16 billion. Roughly $109 billion of two thirds of the spending is in Western Australia, with a further $49 billion in Queensland and $8 billion on 15 projects in NSW and $5 billion on 5 projects in Victoria. A further $256 billion of projects are “less advanced”, including 57 in NSW, 6 in Victoria, 98 in Queensland and 99 in Western Australia, the biggest “investment pipeline” on record. In parliament Treasurer Wayne Swan said “the fact is industry understands that carbon is going to be priced and is continuing to invest - we have an unprecedented investment boom”. The danger was wage and inflation pressure as projects competed for scarce workers. “We have this strong investment pipeline, we cannot compound the inflationary pressures that will flow from that,” he said calling on the Coalition to pass budget savings measures. The ABS figures suggest mining companies are finding it hard to spend money as fast as they had planned with investment intentions for this financial year revised down from $55.5 billion to $51.2 billion since December, the planned spending effectively pushed into 2011-12. The figures show the boom confined to mining with manufacturers expecting investment to climb 4 per cent this financial year before sliding 7 per cent in 2011-12. Construction firms expect investment to slide 13 per cent this finaical year and more than 50 per cent in 2011-12. Reserve Bank Deputy Governor Ric Battellino told a stockbrokers conference yesterday prices for Australian commodities were at record levels and global demand high. It would be impossible for Australia to insulate itself from global inflation. The Reserve Bank board will meet to consider interest rates in 11 days a week after the release of economic growth figures expected to be negative as a result of Cyclone Yasi the Queensland floods. Freedom of Information documents released yesterday show Treasury believes the natural disasters sliced $4 to $5 billion from coal production, $1 billion from agricultural production, $2 billion from retail and related industries and $300 to $400 million from tourism.